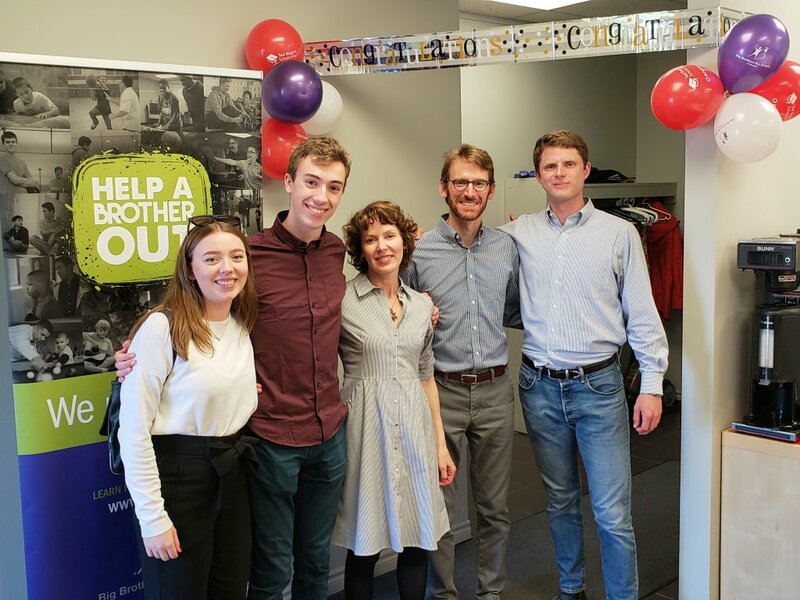 Henry Peirson, a recently graduated “Little Brother” with Big Brothers Big Sisters of Guelph, has been selected as a recipient of the prestigious Ted Rogers Scholarship. The scholarship, made available to children who have recently completed Big Brothers Big Sisters mentoring programs across Canada and intend to pursue post-secondary education, is a multi-year gift that will provide Henry with up to $10,000 over four years. The presentation and announcement of the scholarship was a well-kept secret from Henry, with BBBSG staff quietly collaborating with his family to surprise him with the award at the Guelph office on June 4, 2018. An utterly shocked Henry was welcomed and congratulated by his mother, step-father, grandparents and step-grandparents, aunts, uncles and his former “Big Brother” Justin Varias, who had made the trip into Guelph from his home in Brantford. The two were matched for several years prior to Henry’s graduation from the BBBSG program upon turning 17 years old in early 2018. Henry now intends to pursue Theatre Studies at George Brown College in Toronto in September 2018 and we wish him all the very best!